News concerning the debate over changes to the School Lunch Program has brought the topic of child nutrition and health to the forefront, in recent weeks. 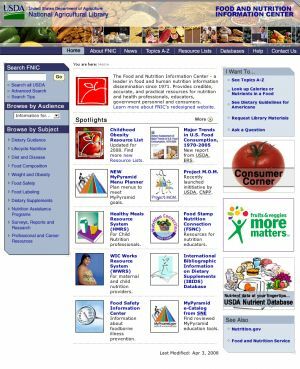 As government and school officials debate this important topic, Government Book Talk takes a look at the Food and Nutrition Information Center Resources CD-ROM currently available from the GPO Online Bookstore. The Food and Nutrition Information Center Resources CD-ROM from the U.S. Department of Agriculture (USDA), Food and Nutrition Information Center (FNIC) contains a plethora of useful information related to various food and nutrition programs, such as the National School Lunch Program. It particularly offers guidance to help nutrition professionals and consumers locate information and materials on specific food and nutrition topics, such as Child Nutrition and Health, Food and Nutrition Education, School Food Service, and much more. Compiled by Nutrition Information Specialists, these Resource Lists provide resources in a variety of formats including articles, pamphlets, books, audio-visuals, and Web links. 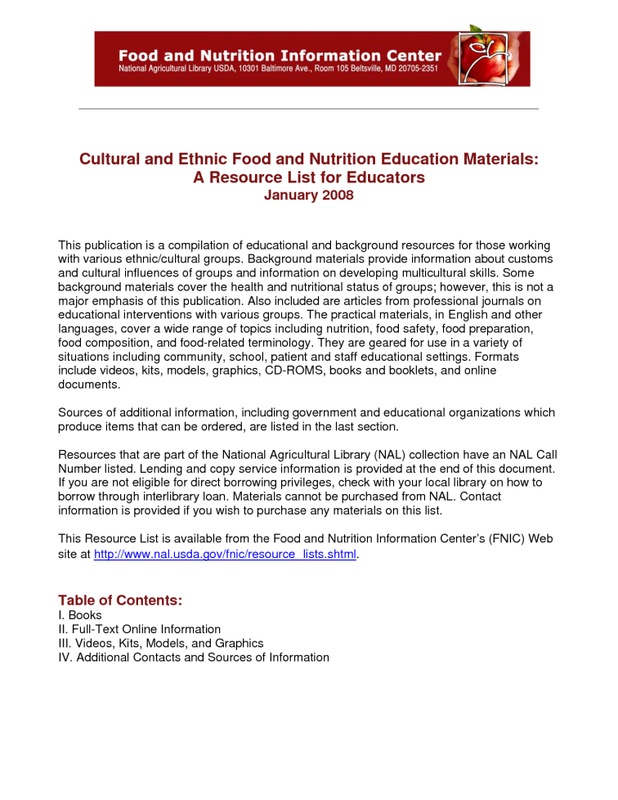 This resource list excerpt from 2008 for educators provides resource information on cultural and ethnic food nutrition. The vast information contained on this CD-ROM from the National Agriculture Library collection will prove to be a great resource for parents, educators, school food service professionals and child care providers. Child Nutrition Programs including before/after school and children’s summer municipal camp programs will also benefit from these resource lists for nutritional guidance and food planning for their summer and new school year child nutrition initiatives. The FNIC website contains over 2500 links to current and reliable nutrition information. According to its website, the FNIC is a leader in food and human nutrition information. Located at the National Agricultural Library (NAL) of USDA, the FNIC provides credible, accurate, and practical resources for nutrition and health professionals, educators, government personnel and consumers. To learn more about the FNIC and its various resource lists topics visit the FNIC website. In addition to the Food and Nutrition Information Center Resources CD-ROM, the USDA has published the following print publication focusing on nutrition and diet, which is also available from the U.S. Government Bookstore. The Dietary Guidelines for Americans, 2010 offers advice regarding nutrition to promote health and to reduce risk for major chronic diseases through diet and physical activity. The publication is oriented toward policymakers, nutrition educators, nutritionists, and healthcare providers. It summarizes and synthesizes knowledge regarding individual nutrients and food components into recommendations for a pattern of eating that can be adopted by the public. Key Recommendations listed by chapter include: Balancing Calories to Manage Weight; Foods and Food Components to Reduce; Foods and Nutrients to Increase; Building Healthy Eating Patterns; and Helping Americans Make Healthy Choices. It also explains the new food plate which replaced the food pyramid. How can I get these federal resources on Food and Nutrition Planning? About the author: Trudy Hawkins is a writer and marketing specialist in GPO’s Publication & Information Sales Division supporting the U.S. Government Online Bookstore (http://bookstore.gpo.gov). This entry was posted on Wednesday, June 11th, 2014 at 6:17 pm and is filed under Children, Consumers, Department of Agriculture, Department of Education, Department of Health & Human Services, Family, Health care, Libraries, Parenting. You can follow any responses to this entry through the RSS 2.0 feed. You can leave a response, or trackback from your own site.